Mark Kerckhoff, “South Ola Vista,” oil, 12×16 in. 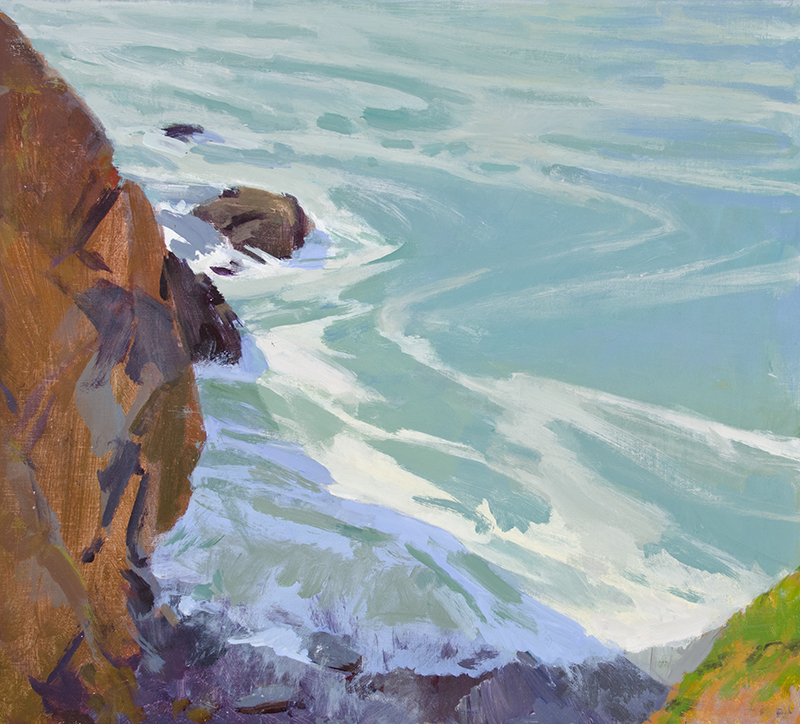 “State of the Art” end-of-year exhibition at Marcia Burtt Studio is a celebration of contemporary landscape painting featuring work by all gallery artists and two invited guests. Paintings range from studied realism to the near-abstract, from tightly rendered to gestural and painterly, from contemplative to bold and energetic, from focused to expansive. This variety allows the viewer to see the beauty in overlooked spaces and to celebrate our grand vistas. The studied realism and exquisite detail, at times reminiscent of the school of Vermeer, displayed in work by Erling Sjovold, Ann Lofquist, and Susan Petty enable the viewer to explore the landscape in ways impossible to the untutored eye. A looser, more expressive, style plays out in different points of view: Jeff Yeomans explores vanishing open spaces and urban landscape with calm, clear-eyed vision; Ian Roberts captures the glowing atmosphere of rural France in small oil snapshots; and Robert Abbott uses cool flat color in his totemic paintings of California agrarian life. Patricia Doyle’s broad brush strokes and angular vision create a dynamic play between representation and abstraction. On a smaller scale, Marilee Krause explores this same tension with ethereal pastel paintings of Santa Barbara’s trails and open spaces. Bill Dewey infuses expressionism into photography in his haunting stills of the coast in flux. Color is at the forefront in paintings by Ann Ward, Michael Ferguson, and Marcia Burtt. Ann Ward finds rhythm, pattern, and color in domestic and suburban settings; Michael Ferguson layers complementary colors to create bold, fauvist coastal paintings; and Marcia Burtt uses minimalist means to reveal nature’s own surprising colors. Guest artists Mark Kerckhoff and Dana Hooper use rich paint application to achieve very different results. Hooper’s buttery strokes of paint and color mixing on the canvas lend a vibrant abstracted pop to cows, horses, and roosters, while Kerckhoff balances casual painterly expression with hot colors, giving life to Southern California scenes. Please join us in celebrating a year of living landscape painting in all its variety on the winter solstice, Friday, December 21, from 5:00 to 7:00 p.m.
Marcia Burtt, “Spindrift,” acrylic, 18×20 in. Ian Roberts, “Evening at the End of the Road,” oil, 8×10 in.